REALLY NICE TWO OWNER, LOW MILEAGE WRANGLER/TJ SAHARA. ALL ORIGINAL WITH NO CHANGES TO SUSPENSION, MOTOR, OR DRIVE LINE. THIS HAS THE HARD TO FIND COMBINATION OF THE BULLET PROOF 4.0L INLINE SIX CYLINDER ENGINE AND 5 SPEED MANUAL TRANSMISSION. 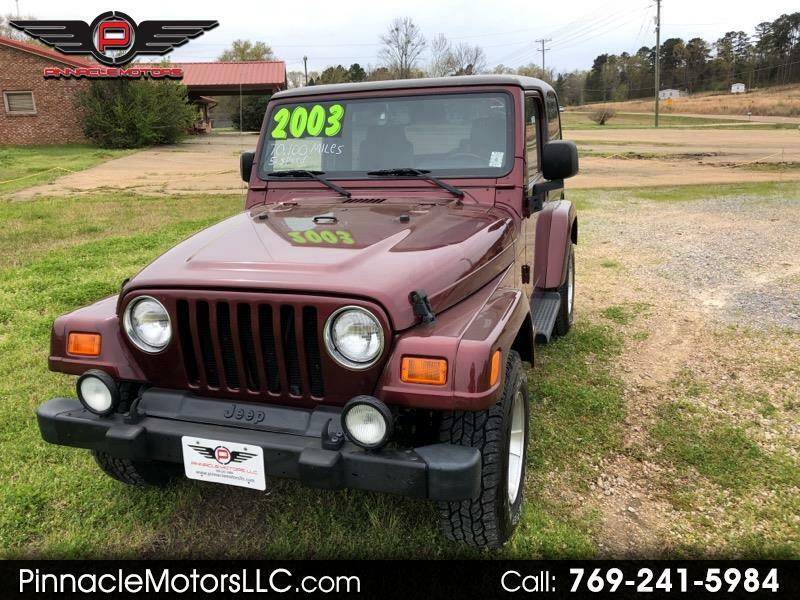 THIS WRANGLER WAS A LOCAL MISSISSIPPI JEEP PURCHASED NEW IN COLUMBUS, MS AND KEPT THERE BY THE FIRST OWNER UNTIL LAST YEAR WHEN PURCHASED BY AN INDIVIDUAL IN BRANDON. UNIT IS ON CONSIGNMENT FROM THE SECOND OWNER. COMES WITH NEW WHITE LETTER COOPER TIRES, HARDTOP AND 2 SOFT TOPS, ONE FULL AND ONE BIKINI, AND TRAILER TOW PACKAGE. THIS JEEP HAS NEVER BEEN OFF-ROADED!! !